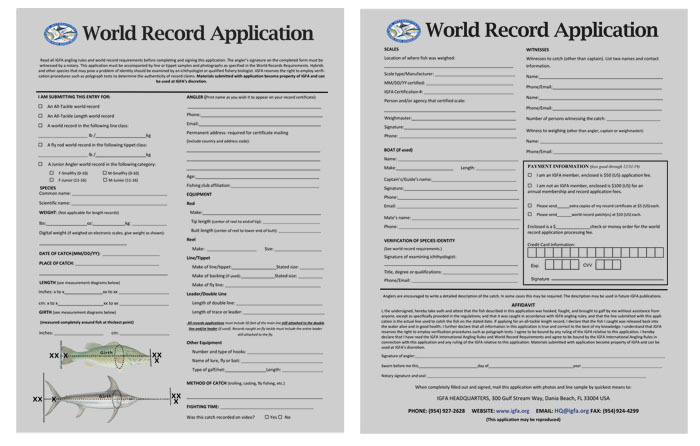 The official IGFA world record application above (click image to download) or a reproduction must be used for record claims. This form may be reproduced as long as all items are included. The angler must fill in the application personally. IGFA also recommends that the angler personally mail the application, line sample, or fly leader and photographs. We also strongly recommend the submission of high resolution digital photos (300 dpi). When making any record claim, the angler must indicate the specified strength of the line or tippet used to catch the fish. In the cases of line class and tippet class records, this will place claim in an IGFA line or tippet class category. All lines will be examined by IGFA to verify the specified strength of the line. If the line or tippet over tests its particular category, the application will be considered in the next highest category; if it under tests into a lower line or tippet class category, the application will not be considered for the lower line class. The heaviest line class permitted for both freshwater and saltwater records is 60 kg (130 lb) class. The heaviest tippet class permitted for fly fishing records is 10 kg (20 lb). If the line or tippet over tests these maximum strengths, the claim will be disallowed. Extreme care should be exercised in measuring the fish, as the measurements are often important for weight verification and scientific studies. See the measurement diagram on the record application to be sure you have measured correctly. The angler is responsible for seeing that the necessary signatures and correct addresses of the boat captain, weighmaster, and witnesses are on the application. If an IGFA officer or representative, or an officer or member of an IGFA fishing club is available, he or she should be asked to witness the claim. The name of a boatman, guide, or weighmaster repeated as witness is not acceptable. The angler must appear in person to have his/her application notarized. In territories where notarization is not possible or customary, the signature of a government commissioner or resident, a member of an embassy, legation or consular staff or an IGFA officer or International Committee member may replace notarization. For any questions concerning the IGFA World Record Application, contact IGFA Headquarters at 954-927-2628 or email [email protected].